Mexico - Guerrero "Mojiganga" Mask, mid-20th c.
Japan - Shrine Mask, 19th c.
Don’t think of a mask as disguise. See it as an outward transformative sign…A disguise predisposes us to think of something as being hidden. The shamanic mask actually says, “Look, something else has been revealed here. Another aspect of the world has been broached and invited and the entity you now see, projected by the face, is a being you might very well know and recognize; its just not the being of the human under the mask!” It is as much the spirit who has traversed dimensions to wear the mask and borrow a body as the other way around. This exhibition has taken a while to put together and is a harbinger of others to come. Beginning with FACESHIFTING: Masking the Spirits Cavin-Morris Gallery is going to explore a year of cross-cultural cross-over exhibitions examining the processes of shamanic impulse as it manifests in Art Brut, Vernacular Art, Indigenous and some Contemporary Art, in other words both mainstream and non-mainstream art of the past and today. This show will feature masks from private collections that have not really been seen in a gallery before; from Africa, Asia; particularly Japan, India, China, Sri Lanka, Korea, Nepal, Bhutan and Indonesia. There will also be Native American masks from Mexico, Guatemala, Inuit and others. It is our goal to present this work as an extension of eclectic contemporary art collecting, not as a byproduct of modernism but rather works that hold their own voices with global Contemporary work at the same time maintaining their high levels of authenticity, quality and refined process. But we have singled out the unusual and the idiosyncratic examples wherever we could, especially in those places like Nepal and Mexico where the traditions are very strong, howbeit creolized, but the permissions for individual artistic interpretations are permitted by the culture itself. 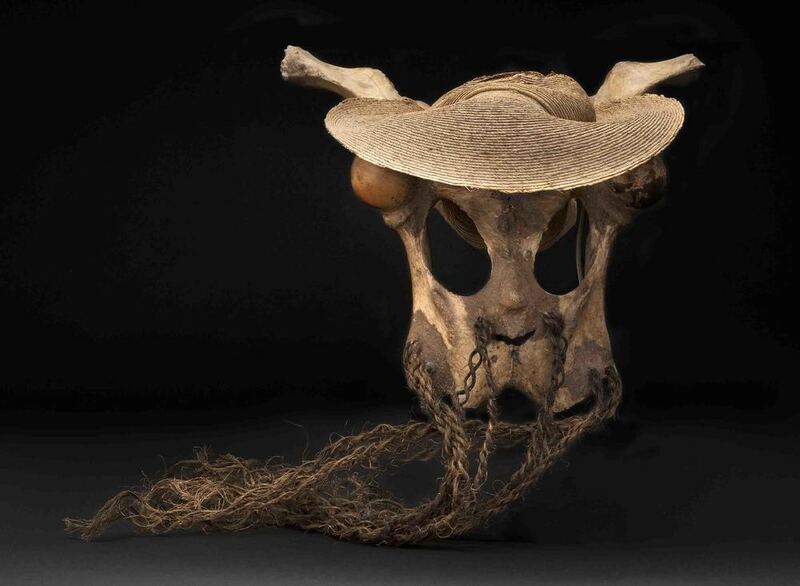 The uses of these masks at their inceptions ranged from pure shamanism to high theatre with roots in the blending of Nature and Animistic spirituality. Again, each mask did not hide the identity of the wearer, it obliterated it in such a way that the ecstatic spirit depicted becomes the masks present and living actuality. Shamanism is a form of mediation and cosmic power brokering between ancestral worlds and the present. It is morally neutral and can range from healing to deliberate implementing of fear and dark power. The shaman is an astral warrior whose own life often depends on the outcome of his multi-dimensional warfare in the spirit world.